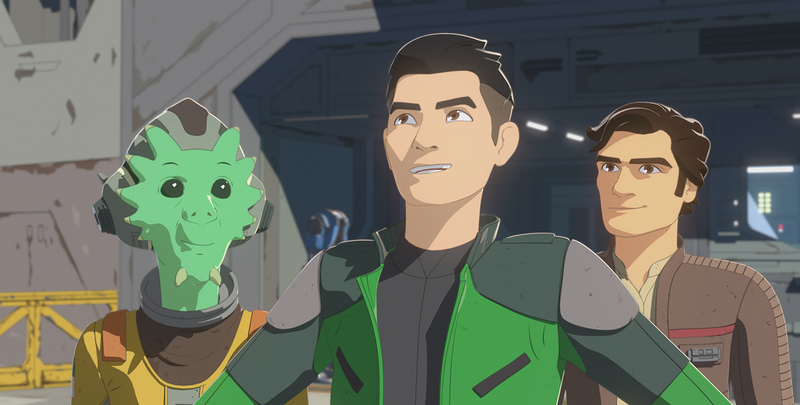 A new direction in Star Wars animated storytelling, Star Wars Resistance takes the audience on a high-speed, high-flying adventure. Fan-favorite heroes like BB-8, General Leia Organa, and Poe Dameron meet never-before-seen characters like Kaz Xiono and Tam Ryvora in a story set just prior to the events of Star Wars: The Force Awakens. The series was created by renowned Lucasfilm Animation veteran Dave Filoni (Star Wars: The Clone Wars, Star Wars Rebels); executive-produced by Justin Ridge (Star Wars: The Clone Wars, Star Wars Rebels), Athena Portillo (Star Wars: The Clone Wars, Star Wars Rebels), and Brandon Auman (Teenage Mutant Ninja Turtles); and art-directed by Amy Beth Christenson (Star Wars: The Clone Wars, Star Wars Rebels). Star Wars Rebels continues the tradition of epic feature film storytelling combined with unprecedented production quality. The Emmy-nominated series introduced multiple fan-favorite characters and garnered critical acclaim for its compelling storylines throughout its four seasons. Executive Producer/Director Dave Filoni (Star Wars: The Clone Wars) created Star Wars Rebels with Simon Kinberg (X-Men: Days of Future Past), and Carrie Beck (LEGO Star Wars: The Freemaker Adventures). They worked alongside many members of the original production team from Star Wars: The Clone Wars. In a fateful confrontation, Ahsoka Tano meets Darth Vader in an epic duel on the dark world of Malachor. The young Jedi Ezra Bridger and his master, Kanan Jarrus make an effective team with the former clone trooper, Captain Rex. The rebels find their most formidable opponent yet in Grand Admiral Thrawn. From embittered enemies to loyal friends: Agent Kallus and Zeb Orrelios. Descended from a proud warrior culture, Sabine Wren is a deadly fighter and a gifted artist. An ancient being strong in the Force, the Bendu lends a new perspective to Kanan Jarrus and Ezra Bridger. The fearsome warrior Maul has a fateful reunion with an old enemy. With its first-ever weekly CG TV series, Star Wars: The Clone Wars, the studio broke new ground in facial expression, character movement, and detail while richly expanding upon the stories introduced in the live-action films. The Emmy award-winning series ran for six seasons, producing over 120 episodes, and introduced Ahsoka Tano, Captain Rex and countless other memorable new characters. One of the Jedi Order’s greatest warriors, Anakin Skywalker is a freethinking general in the Republic Army. The Clone Wars are fought on remote planets across the galaxy, including the clone troopers’ homeworld of Kamino. The deadly assassin Asajj Ventress returns to her home planet inhabited by the mysterious Nightsisters. A loyal friend and fierce warrior, Chewbacca is a prisoner when he meets Ahsoka Tano on a remote jungle world. Jedi Master Obi-Wan Kenobi is met by an old and deadly foe when the evil Darth Maul returns from exile. Master Yoda is the oldest and wisest member of the Jedi Order, and proves in the Clone Wars that he has plenty of fight left within him. As Anakin Skywalker’s padawan learner, Ahsoka Tano grows from a headstrong student into a mature leader. Supreme Chancellor Palpatine of the Galactic Republic has a greater influence on the war than most realize. A series of animated shorts spanning the entire Star Wars saga, Star Wars Forces of Destiny explores everyday acts of heroism that shape the destinies of some of our favorite characters including Rey, Ahsoka Tano, and Princess Leia. Developed by Lucasfilm Animation, the series features many original actors reprising their roles including Daisy Ridley (“Rey”), Felicity Jones (“Jyn”), Mark Hamill (“Luke”), John Boyega (“Finn”), Ashley Eckstein (“Ahsoka”), Tiya Sircar (“Sabine”) and Lupita Nyong’o (“Maz”).